We manufacture High Precision Hydraulic Adaptors on CNC Turning Centers. High Graded Steel SAE 1018 Cold Drawn Hexagon Bars are used as raw materials. Material is rigorously tested and only stress free and crack free normalized bars are used. We manufacture Hydraulic Adaptors for OEMS and bulk Export Order. 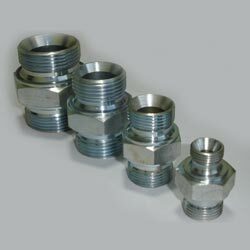 Adaptors are manufactured as per requirements of ISO 8434 & BS 5200.